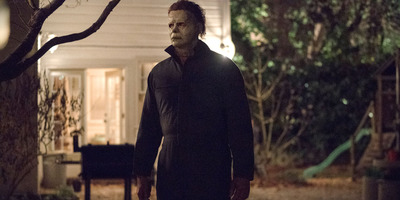 “Halloween” won the box office for a second consecutive weekend, earning $US32 million. That puts the movie’s domestic total to an incredible $US126.7 million (it was made for only $US10 million). This marks the first time a “Halloween” movie has hit the $US100 million milestone. “Halloween” looks like it’s going to have major staying power as we get closer to its namesake holiday. In its second weekend in theatres, the new direct sequel to the 1978 original won the box office with an estimated $US32.05 million. The Universal/Miramax/Blumhouse production took home the box office crown for a second-straight weekend and now has a domestic cume of an eye-popping $US126.7 million (the movie was only made for $US10 million). This marks the first time a movie in the “Halloween” franchise has hit the $US100 million milestone. Most of the competition stayed away this weekend, leaving the few new releases like the Gerard Butler submarine thriller “Hunter Killer” ($US6.6 million) and the latest title from Rowan Atkinson’s tired spy spoof franchise “Johnny English Strikes Again” ($US1.6 million, though it’s earned over $US100 million overseas) having no chance up against Michael Myers. Though on the specialty release side, Amazon Studios’ “Suspiria,” the remake of the horror classic by Dario Argento, took in the top per-screen average of the year with $US89,903 on two screens. “Halloween” will have its first major test this coming weekend as titles like like Fox’s “Bohemian Rhapsody” and Disney’s “The Nutcracker and the Four Realms” hit the multiplexes.